The Cove chair ... designed by Foster + Partners. THE Cove lounge chair, designed by Foster + Partners for a variety of public spaces, recently made its debut at the Passenger Terminal Expo in Stockholm, Sweden. 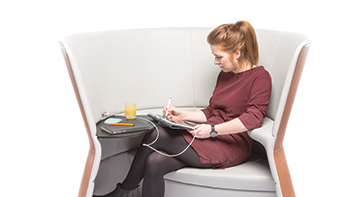 Responding to the desire for privacy within busy spaces such as airport lounges, its generously curved form provides ample room for a person to relax or work in comfort, while offering him a sense of seclusion. The Cove chair, manufactured by Poltrona Frau of Italy, is suitable for a variety of areas including public lounges, receptions, showrooms and has been designed to function as part of a cloud-like cluster of chairs. The refined materials and minimal aesthetic bring together comfort and practicality to create a unique product. Its distinctive curved form was the result of studies into the different ways guests adapted the existing lounge furniture. The circular form incorporates a wide, comfortable seat, an integrated USB charging point and an optional mains power supply and a table, which can be used as an informal desk. The ribs of cushion at the back of the chair extend in places to form ridges, which can be used as armrests. The inner and outer surfaces can be customised in a variety of leathers and fabrics. 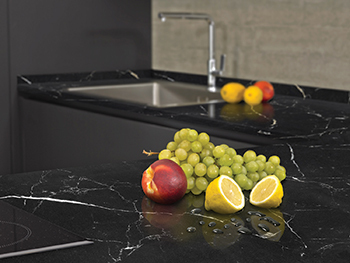 FILA Surface Care Solutions’ new Filamarble Aid – an acid and stain-resistant protective treatment for marble and natural stone surfaces – has won the “Best of Innovation 2018” award from the recent International Surface Event, Stonexpo Marmomac, in Italy. “Due to the inherent qualities of marble, numerous projects make use of it for both indoors and outdoors areas, yet so far there has been no effective protection against acidic substances or stains, which has sometimes had disastrous consequences,” says Fabrizio Nicoli, commercial director of the Middle East branch of Fila. Filamarble Aid does not alter the stone and leaves its surface intact. Its safe, water-based formulation has a low VOC (volatile organic compounds) content and forms a barrier against stones, thanks to its micro-coating technology. It can be used on both new and pre-treated materials, including outdoor surfaces, as it is resistant to ultraviolet (UV) rays and thermal shocks. The new treatment is described as being ideal for all bathroom and kitchen surfaces, matte and polished alike. The Mawi bathtub ... spa experience. GLASS1989 has enhanced its SpaRituals collection with new products such as the striking Mawi bathtub. The Mawi bathtub’s generous size and minimal design create an ultra-comfortable experience, according to a company spokesman. It is offered in two versions: built-in or freestanding. In the latter version, the bathtub features a relaxing area with four cushions. The new control system incorporates chromo and bluetooth functions as standard features and provides an intuitive approach to the product and its functions. 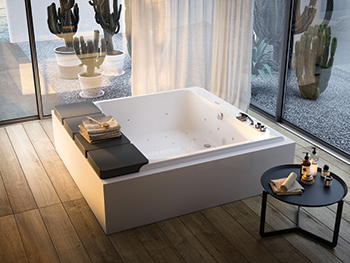 Mawi includes the hydromassage system traditionally offered by Glass1989, but now enhanced with new Filo jets, and SkinSublime, an innovative system that makes this bathtub a true must-experience for ultimate well-being, says the Italian manufacturer. Mawi’s Minispa version is designed for indoor or outdoor installation.